Let me just say that the maple leaf shape of tonight's meal inspired many ideas as to what to call the dish. But, in my attempt to help people who are Googling their way through the interwebs looking for easy vegan kids meals, I went with the more boring yet descriptive title above. Tossed on the scrap heap were "Tofu for Hosers," "Baked Tofu, eh?," and "Tofu Night in Canada." Of course, these may only be funny to Canadians (and maybe not even then). 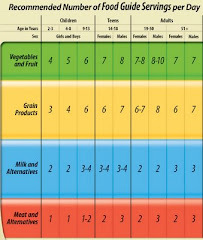 Anyway, the problem I tried to solve tonight was how do you get kids to eat tofu? The answer? Make sure it doesn't look like tofu! 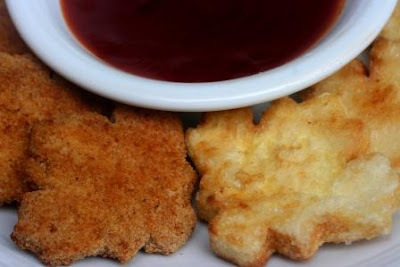 A funky shape, some breading, and a good dipping sauce will go a long way. I prepared these two ways--crispy fried and oven baked. I liked the crispy fried but the kids liked the oven baked hands down. Cut tofu into 1/4" thick slices, then stamp out shapes with cookie cutter. Toss tofu shapes in cornstarch then place on a plate or cutting board. Let tofu sit for a few mins to let the water from the tofu soak into the cornstarch and make a coating. Fry in oil over med-hi heat until golden brown. 1. Combine soy milk, lemon juice/vinegar, flax (if using), onion and garlic powder, and salt in a bowl. Put bread crumbs in a shallow baking dish. 2. Cut tofu into 1/4" slices and stamp shape with cookie cutter. Dip tofu shapes in soy milk mixture, then toss in bread crumbs. Place on baking sheet and spray lightly with oil. 3. Bake for 10 mins per side, or until crispy and golden. 4. Serve with your kid's favourite dipping sauce. I used my sweet and sticky BBQ sauce. WHAT DO I DO WITH THE LEFTOVER TOFU? Gather all the scraps leftover from the shape cutting and make some eggless salad. See? Now you have lunch for tomorrow.